Thanks to all who visited and for the many lovely birthday wishes. The party favors will go out in today's mail. *A sister of a friend came in to help me with my press release and walked away with (my gratitude and) delighted by the several ATCs that she had made for her collection. And speaking of ATCs: this Saturday is Art At The Library time again: from 2:00-4:00pm we will be learning a technique that I call "papercut molas" after the Kuna reverse applique. Now those beautiful quilts are done in fabric and we will be working with colored paper. Let me get you a photograph. I have a couple on the Trading Rails here at the Studio. These are made of cut paper - each layer cut separately. I think that this might sound confusing, but the way that I have devised to do the cuts is actually pretty easy. Everyone is welcome at these Library groups. 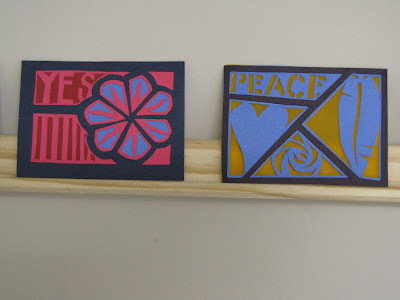 Anyone not old enough to work with an exacto knife can still make ATCs with scissors. We hope to see you at Sunne Spot on any morning and at the Rockport Library this Saturday. I can see how they are made, but the hard part must be designing the card before you start cutting. I can see that this is a process in which a good computer graphics program is invaluable. Actually, Juliet, no computer is necessary. The layers are cut consectutively so that you know how to design the next layer as you go.